We Brits are very keen on DIY (or the idea of it) but failing at DOM (disposing of materials) afterwards. Incredibly, we are hoarding 139 million litres of partly used or even unopened paint – enough to cover more than 250,000 football pitches. The problem isn’t just down to tins left over from a completed job, there are paints still waiting to go on walls or woodwork after the home decorator gave up part way through. Research for home improvement retailer Wickes revealed that almost half (44 per cent) of those surveyed admitted defeat and are living with unfinished projects. The abandoned tins are mostly left in garden sheds (32 per cent), in garages (23 per cent), even taking up space meant for parking the car, and underneath the stairs (15 per cent). Debbie Jackson, a business development director from London said in the survey, ‘My cellar is filled with tins of paint, I hardly have any storage space left. We’ve probably got as many variations of ‘white’ as you would find in a shop. For those who have made all the improvements they want (for the moment), the reason they could be hanging onto the tins could simply be that they don’t know how to get rid of them safely. 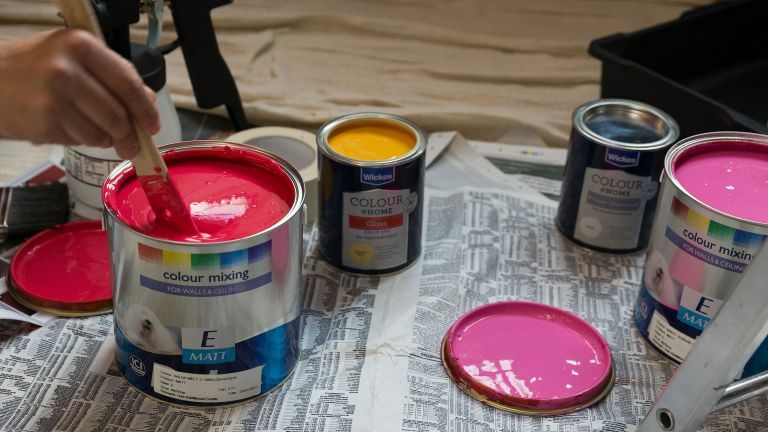 Three in five people surveyed said they weren’t sure how to dispose of their paint in the right way, or know that it can be dangerous to the environment if it’s not done properly. FYI: you can take paint to your local waste recycling centre – though check their website first. They also prefer it to be dried out and may not accept trade-sized containers. There are companies such as PaintCare and Community Repaint that collect leftover decorative paint and either reuse or remanufacture it, or redistribute it to benefit individuals, families, communities and charities in need at an affordable price. And if you were keeping the paint ‘just in case’, it’s worth knowing that opened paint has a shelf life. Water-based acrylic and latex paint should ideally be thrown out after two years if opened, while tins that haven’t been opened can last up to 10 years. Yvonne Kelly, paint category manager at Wickes, comments, ‘It’s very common to find paint collections in sheds or garages over the years, although we were surprised to learn the true extent and volume of paint stored in homes across the country.